In September 2012 Kelly and I did a week long liveaboard dive trip in Indonesia which went from Bali to Komodo and back. We went on the MV Mermaid II. Click here to read about the boat. This is one of the dive sites we did on the trip. The trip heads north-east from Benoa Harbour on Bali out north of Lombok and then north of the other islands to Komodo Island and then down the eastern side of Komodo to the southernmost point of Komodo. For all dives on this trip we used 31% Nitrox, so bear this in mind when considering the bottom times we did. This dive is located off Satonda Beach, Satonda Island (Pulau Satonda). This island used to be a volcano. Nowadays there is a lake in the crater and the island is not very high at all. You can walk up to the crater and have a look at the lake. 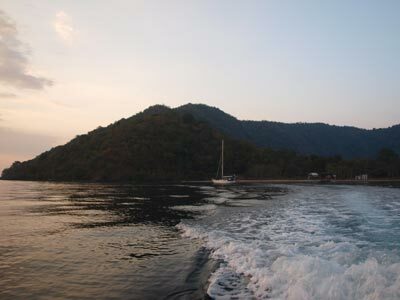 Satonda Island is located north of the north-western point of Sumbawa Island. 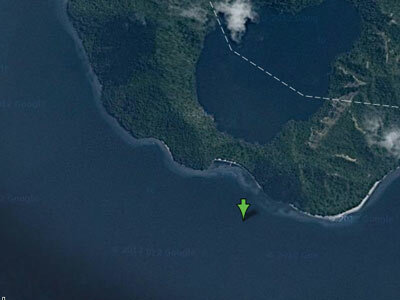 An approximate GPS mark for the dive spot is 8° 7' 16.6"S 117° 44' 48.0"E (using WGS84 as the datum). The site is located to the north east of the GPS mark. The actual site is located off the beach and consists of the sloping black sand down to about 18 metres. At either end of the beach there are some larger coral bits, but the main part of the dive site is sand. As with virtually all dive sites that you do when on MV Mermaid II, you use the RIB (rigid inflatable boat) to get to the start of the dive (and also to get back to the boat). The RIB will drop you normally about 50 metres off the eastern end of the beach. We drop into seven metres and then gradually descend to about 12 metres as we head west across the sand. 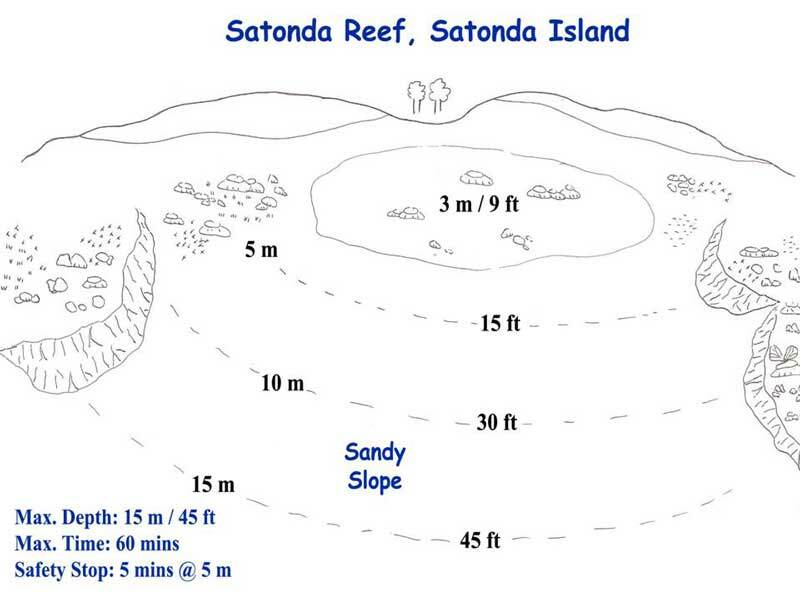 The plan for this dive is to continue crossing the sandy slope till we reach the reef and then go up a bit shallower and head back in the opposite direction. One of the things we were warned about before this dive was that the firefish (lionfish) have adapted to hunting at night using the light of divers� torches. This means that you have to be very careful to not put your torch on a smaller fish for more than a few seconds as the firefish will attack and eat anything that is lit up for too long. Sure enough, as soon as we hit the bottom we see firefish. They are not in plaque proportions, but they are all over the place. You really do have to be vigilant to make sure that you do not cause the premature death of a smaller fish! While most people would think that a sandy bottom is boring, this dive site is anything but boring. Although the bottom is mostly sand, there are tiny bits of coral and possibly rock which provide hiding places for fish. The sand has lots of stargazers. These are a very ugly fish that buries itself in the sand so that the only parts visible above the sand are the eyes and the outline of the mouth. They have a flat top and rounded body. In Sydney we sometimes see stargazers, although mostly on the deeper wrecks. Our stargazers are much larger than the ones here, probably double the size. I end up seeing three, although some others saw more. This site is obviously a macro site (or muck dive as some call it, a term I hate as it makes out the site is rubbish). The amount of things to be seen here is simply amazing. There are so many creatures that we have not seen before, the whole dive ends up being a bit of a blur. The only way I ended up remembering everything we saw was to look at the video I shot (I took Kelly�s GoPro). As well as a brilliant clown anglerfish (tiny about 20 mm), there are gurnards, spotted eels, shrimp, fire urchins with amazing crabs, razorfish and flat worms. There are dozens of different species of nudibranchs and numerous different jellyfish. This was a brilliant night dive, as good as any I have done anywhere in the world. The visibility was at least 30 metres and the water temperature was about 27�C. Click here to return to see the dive profile from my computer. A video filmed and edited by Kelly of this dive. Click here to return to the list of sites we did on our MV Mermaid II trip.